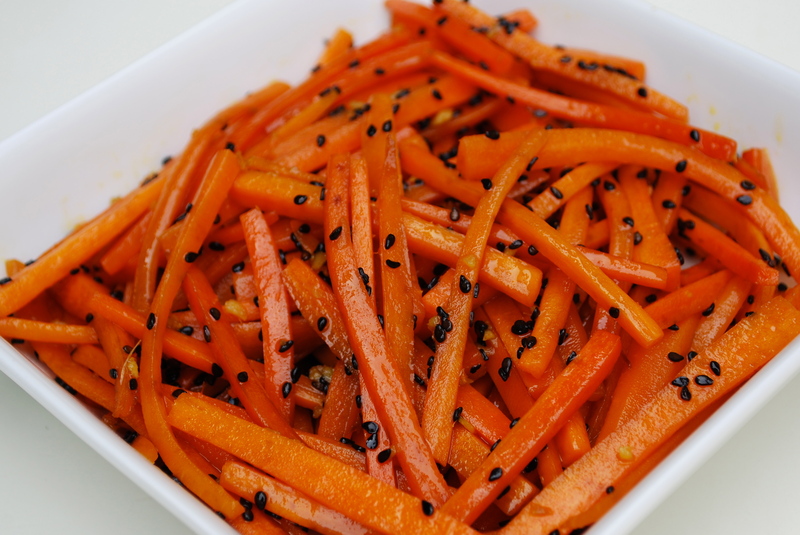 Carrots with Black Sesame & Ginger | Time to Cook! This is a different take on carrots as your vegetable! Very colorful and delicious with Asian flavors and can be made ahead! Heat the olive oil in a large non-stick skillet set over high heat. Add the ginger and cook, stirring it into the oil, until it becomes fragrant, just 30 seconds or so. Add the carrots and stir to combine them with the gingery oil. Add a big pinch of salt and 1/4 cup of water and turn the heat down to medium-high. Cook until the carrots just begin to soften and the water evaporates, 4-5 minutes. Stir in the sesame oil, soy sauce, and sesame seeds and serve.